1. My laptop bricked on Friday – if we understand that I am here using the word “bricked” as in “the laptop became a brick.” Which is to say that it has decided to fulfil its ultimate goal of being a really, really expensive paperweight. It was backed up, so I’m not really that upset (except about what it might cost to fix it, but until I hear back from the laptop fixers, I’m just breathing through my nose when I think about it) but not having it is proving tricky. I’m trying to live a life through an ipad, so we’ll see if I can get this entry off the ground. Forgive any oddities, will you? 3. In 1989 I bought a card of old buttons at Fabricland. They were 50% off because one of the three buttons was missing. 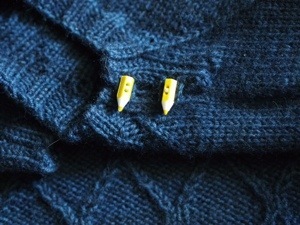 Today I sewed them to Lou’s sweater. Don’t let people tell you your stash doesn’t pay off. 4. Holy cow is it hard to figure out how to do this on an iPad. 5. I started that vesty thing with my Habu Linen. 7. Today Sam and I are taking the day (or as much of it as I think I can take) to go shopping for clothes. The tour starts in a week (Hey – look over in the sidebar! I have a tour page back again, and it’s working and easy to update! I’ll be adding things that are coming up over the next few days) as always, it is coming down to pants. Well, pants and a shirt – or maybe two shirts, and when I’m in the store by myself I can’t find anything. Sam says that I just don’t know what I look good in, because I can’t see myself properly, and I’m too hard on myself, and so she’s coming along to suggest things I might not normally consider. 8. I’ve promised to be actually consider some of the things. 9. I’m still never going to put on skinny jeans. I’m totally with you on the skinny jeans unless I’m wearing tall boots that go up my calf 🙂 I have also tried to blog from an iPad. It can be somewhat of a pain. I hope your laptop is fixed soon and doesn’t cost too much. Ok, here’s the deal. I work with dancers who want to look good and also want to be comfortable. I have no stock or interest in this company and am only recommending it because I too have a real problem finding pants that look good and don’t look like I am trying to wear a 17 year old’s pants. Lululemon. They are supposedly yogawear but they have some really tailored looking pants made out of stretchy fabric and the seam construction is unbelievable (especially for someone who sews). The other pants I have found that I like, wear and look good in are by Not Your Daughter’s Jeans (great name, eh?) good luck, and remember, it’s really what’s on the inside that counts. c) I had a pair I brought to Africa and I lived there over a year. The pants are still in good shape despite using local laundry (aka clothing killer laundry). So the price is justified IMHO because it is a quality product. I think it would be fun if WE could update the Tour Page. Yeah, what she said. It’s been winter here a long time and I need a diversion. With all your cycling, you would probably look good in skinny jeans, a tunic sweater and a cute pair of flats. Go, Sam, dress her right! I would probably update the bra supply, too. I tried on a pair of skinny jeans once. Even the saleswoman laughed once she knew I was ok with it. Reitmans. Boring but safe pants, that usually fit me. YES! You rock the iPad. I love it when my daughter can shop with me. She has good sense and her choices always look good (or at least as good as it gets) on me! Oops! Never mind, I found it. Good plan. Skinny jeans flatter NO ONE, even skinny people. Get a pair or two of black silky-texture pants (they don’t wrinkle and dry quickly), one or two bright-colored tops, or even neutral tops with a bright scarf or necklace for a pop of color, and you’re done! You totally have the body for skinny jeans- not only, but they are the perfect background covering for lots of the tunic type sweaters! I’m sure your Sam will get you some great choices. The sweater is adorable! Can’t wait for Seattle’s night to host you! Reitmans. Northern Reflections. Safe, comfortable. I like the cotton twill myself. And they have petite, so you may not have to hem. Take some of Sam’s suggestions for trying them on. You DON’T have to buy what you don’t like. Courage. Skinny jeans. I totally thought if you could put them on you’d automatically be skinny. Little Lou’s sweater is wonderful. That color is one of my favorties. Nice job, though I think you knew that already. I also dislike shopping for pants, and for years have stayed clear of anything slender in the legs. (definitly can’t do skinny jeans!) This time around, I tried Ricki’s, and their store line of jeans. I fell in love with a style called Barely Bootcut. It fits slender through the leg, with a little bit of body from the calf down. I thought I would like it less than my bootcut, but they are the most flattering pair of jeans I have ever worn! Perhaps not skinny jeans, but slim cut pants are very flattering to us short people. I know Sam will do right by you. Skinny Jeans – it is not the legs that are the problem with them but .. the area where you sit. We tried some last week – they are ok if you standing up and not breathing too hard, but the thought of sitting down for any length of time – just no, no way. 20 years ago I fell in love with shalwar pants – East Indian pants with tight ankles and big lose hip areas – wonderful things, you can do the splits in them and not get a wedgie and unlike yoga pants they don’t illuminate your privates. My best shopping tips: take a friend and use the camera in your phone. Pix tell you so much more than mirrors, esp the back view and for buying glasses. When you find something that’s right, buy in every color that works and you can afford. Don’t think you’ll come back in 6 months and get more, they won’t be there. Although I’ve bought 1 of something and then when it doesn’t fall apart on first wear or wash, I go on the web and get more. Hoping you have much success and some fun! No skinny jeans for me either. I just HATE the fact that there isn’t anything else in the stores these days but those pants you need a shoe-horn to get on…I really wish sof flowing wide legged pants would come back into fashion. There are some things over 40 women should never do. Skinny jeans are one of them. Belly shirts are another. Go with solids that all match. Or a couple big shorts that you can put tees under. I’m a curvy girl, so jeans & pants can be an issue for me, too. I have good luck with Levis curvy fit (sometimes called 529). I’m currently wearing a pair in a curvy fit with skinny legs. They have a good bit of stretch to them so they fit but are still comfortable. I found mine at Kohls. I’m not sure if you can find them by you, but they may be worth a look! Good luck!!! No one should put on skinny jeans. Ever. You should go see Marilyn (at Marilyn’s) on Spadina (near Queen). You tell her you are going on a book tour. She will dress you and you’ll be astounded! I’ve moved to SF but whenever I’m in Toronto I go to Marilyn and get her to dress me and I’m never disappointed. She’s awesome! Having just returned from a post-reconstruction bra-buying attempt, I’m about to join your team. As it is, I’m skimming off ideas here — Lululemon, for example — and second the wish for a return to palazzo pants. If my youngest weren’t a continent away I’d hand her my credit card, say “Dress me” and go about my proper business. Good luck, there. A tip from someone who has been there: Warner makes several styles of wireless lightly-contoured bras. Avoid Vict. Scrt.’s industrial-strength padding. If you are now asymmetric, buy a ‘chicken cutlet” insert to slip into the cup on the smaller side. You WILL look and feel great again, despite everything. Your answer to Rams is why I love the comments on this blog. Skinny jeans are definitely in my future … just as soon as I lose 5 kilos and 40 years. Palazzo pants are not as flattering as some people think. If you are short and/or wide, they make you look shorter and give the impression of a galleon under full sail. Skinny jeans are the work of the devil; alternatively they are a mean trick by fashion designers to make you buy everything else that ISN’T skinny jeans once the fad passes, unlamented by most. I’m statuesque, myself, and try not to present too large a canvas to the world, wary of making myself appear larger than I really am. Slender jeans made with a deep enough crotch measurement and a tiny percentage of spandex actually work surprisingly well with longer tanks, T’s, and sweaters. Jackets are the thing, too – they camouflage a multitude of sins. Wear a longline jacket with coordinating slender-ish pants and a bright-coloured contrasting T or tank. Trust me. Why don’t you just leave the shopping to Sam? It’ll be a lot quicker that way, and you can stay at home knitting in the mean time. I’m sure she’ll pick some nice stuff, since she will have to look at you wearing it – and her friends might see you. Alternatively, ask Sam to tidy up her closet. Most teanagers have loads of perfectly good clothing that they won’t wear. Recycling is good for the environment and you’ll have more money for yarn that way (or for fixing laptop 🙂 Good luck! I have 2 daughters and that would have only worked with the youngest before she had her second child. Now both girls are bigger than I.
Don’t dismiss the skinny jeans until you try on a pair with some tall boots! They’re actually very comfortable and go great with sweaters! My mom wears them all the time and she’s 62. They’re actually more flattering on her than straight leg jeans. What is the vest that you are knitting? I haven’t used Habu Linen before. Do you like it? Anyone any idea as to brand/style/source? That is awesome that you are going shopping with Sam–she will help you find travel outfits for sure!!! She is under pressure to deliver the goods, so you will owe her a hand knitted item of her choice!!! LOL Can hardly wait to see pictures! When you are in Seattle you can go to REI and get lovely pants. Ask for them to find petite casual pants for you. They will bring them for you to try on. You will find something that you will wear for years and years. And years. A little high but not having to shop often? Priceless. I have a lovely daughter also, who has her black belt in shopping. She swears by Reitmans; they have really comfy pants. And Old Navy. She picked out a top for me there and advised me that it needed a camisole underneath. I chose one, but she made me put it back and found me the right one. I love all the choices she made. On my own, I don’t know what I would have come home with. It’s hard to shop when you are a certain age. What are women my age (not old, but not young) really supposed to wear? Good luck getting Lou-who’s-two into his sweater. …and bras are on sale everywhere. Just sayin’. Excellent point! Nothing like a couple of new bras for a book tour! Although, I don’t think I could take my daughter bra shopping.. but you know, I don’t have a daughter, just sons, so, not an issue for me! My comment was just eaten! Good luck on the pants. I hate shopping for pants. I’d take looking for a swimsuit over looking for pants. Glad you’re taking a consultant along. Do you ever come “south”, like to Atlanta, for instance? Stitches South will be here sometime in April. Any chance that you’ll be there? Eddie Bauer guy’s jeans in Classic fit. They’re way cheaper, last longer, and are the antithesis of skinny jeans. Just plain old straight-leg jeans. LLBean makes some great men’s chinos – Pathfinders – and I’ve got about 6 pair. Don’t know what size I am in women’s pants, but I’m a 34/32 in men’s! At that point just buy Levis 501 jeans, they’re essentially unisex and nobody can tell you’re a girl. At least you don’t have to deal with extra room for external genitalia. Try on a pair of skinny jeans. Confirm one way or the other how they look on you and move on. Bringing someone you trust shopping with you is the *only* way to go. My sis and SIL are my go to people. Definitely go with an open mind, and believe me, you might have fun! Skinny jeans only look good if you are under the age of 25 and haven’t had kids… I’m not even going to try to do that again. I don’t color my hair either..
Lou’s sweater is beautiful.. what a lucky boy to have 2.. what a hysterical story! it was bound to happen! What the heck are poopy pants?????? I’d guess the reference is to drop crotch pants; the crotch is lowered, anywhere from a few inches to as low as mid calf in the most extreme cases. They’re frequently referred to as “poopy pants” by judges on project runway. I’m with you on the skinny jeans, but Sam might also be right. Sometimes you need someone who can see all of you with an un-jaundiced eye. 1. Sorry to hear about your laptop, a writer’s life with just an iPad to navigate the blogging world is no fun. 2. Love Lou’s sweater, if mom works it right she’ll look the laundry queen, no one needs to know Lou’s got two. 3. 1989?! that’s a long time, I’m glad it paid off. 4. But you did it, that deserves a beer, or a piece of cake. 5. 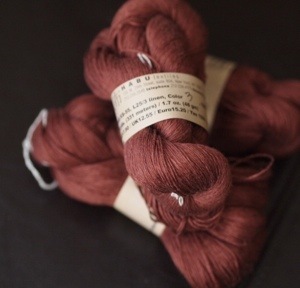 That yarn is gorgeous. 6. Can’t wait for you to share. 7. Good luck. Sam probably deserves a beer or piece of cake, too. 9. Remember what you said in #8. Boy, I can’t get over the number of people who hate skinny jeans. I love mine but maybe I need a different mirror (and I am not a size 8 even, let alone a size zero). 10. I love your blog. Thanks for letting me be a pest :). I forgot to add to 2. – Blurry photos didn’t stop me today, I probably gave 20 people a migraine, poor folks. I just caught up on your posts and learn you’re coming to Portland. I promise I won’t do anything to embarrass you like sing a song about you or anything. Most of the knitters will be recovering from the Rose City Yarn Crawl (including me) so we’ll give you a lovely reception. i second the vote for levi’s curvy style jeans. i am not curvy and i usually wear men’s 501’s, but for some reason the curvys fit me and are comfy and do not gap at the back waist. i also have had great luck with land’s end’s pants. they fit just like the measurements given in their size chart. they have classic fits and styles, and i think they even come in different lengths. the best part is that once you find ones you like, you can buy them in every color. Even horribly skinny women don’t look good in skinny jeans… unless they’re 12. Worst comes to worst, wear the red dress you wore on the bike-a-thon. Unless seeing you in it made a lust-crazed Joe rip it off you 😉 ! Sorry your laptop bricked. You did a pretty darn good job on the tablet though. Lou’s sweater is lovely, I hope he cooperates with a photo or two! I recently spent a day in a Sally Melville workshop. That gal got me to totally see myself differently! While I’m not going to jump into skinny jeans, I will wear stretchy leggings now, and not just with a tunic either. Multi-layers, asymmetrical hems, color in unexpected ways. I’m trying to free myself up from black, khaki and white (which I still love, but there is more to this world than neutral). So, let Sam do her magic on you. And take lots of pictures. That’s what daughters are for, right?!? since you are actually OUR Harlot and by OUR I mean CANADA is there a chance you will tour up here too? I have never….and I mean never, enjoyed anyone’s blog as much as yours. Your writing is as amazing as your wit. I never miss a day. I am a beadweaver, but knitting was my first love and I still have something on my needles at all times….usually socks. Thanks for your wonderful posts…they make my day. Gorgeous sweater! Do you have a pattern on Ravelry? I just started reading your blog, so forgive me if you’ve already shared it in a previous article. I was introduced to your blog by the wonderful knittings in The Knitting Lodge community on Google+ who recommended a blog post of yours from 2006 to help me fix a cable I had messed up about 10 rows earlier. Your article, combined with a bottle of beer, a crochet hook and a lot of swearing, did the trick! My work now looks amazing! So thank you! Pencil buttons! I have some green and yellow ones from my Grandmother’s button stash – it’s lovely to see them here. As for shopping: taking along a daughter who will push you towards new things is a good idea (may I borrow her?). My advice: buy several bras, so you don’t need to buy any more for years. I wish you were traveling to Boise on this tour – my trips to Portland and Seattle are exactly a month after you visit. Have a great tour! Trust Sam, she has your best interests in mind and heart when shopping for new clothes. Go for classy and new! Best wishes on a good swing trip through the States! I shall miss you once again because you are not coming to any of the southeastern states. I actually found this more enenitainrtg than James Joyce. 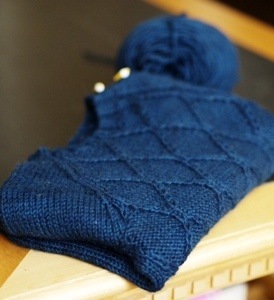 The Lous sweater is quite dear…love it and te buttons. Brilliant idea to shop with Sam – do try it on, ou never know what it will look like. Three cheers for pants! I’m in favour. Finding someone who can help with this stuff so many of us struggle with–priceless. Wishing you success. The problem with shopping with 20-something daughters is when both of you are trying not to laugh out loud at what the other chooses for each other. The good part is that they want to give the trip a try. Said the woman whose daughter introduced her to a flash-sale site, who finally looked at it, found a knitting-embossed leather tote and later found out said daughter was seeing it on her own screen on the same night and rolling her eyes and proclaiming, Oh, that is SO Mom! I apologize for this being out of context but it relates to your Mexican shopping experiences. The deep red paste wrapped in plastic might well be mole. Mole is usually made with lard, known as manteca in Mexico. You will want to know that. Another out of context message. It’s true that many English words can be changed into Spanish with simple changes. But it doesn’t always work. And one of your examples is indeed not quite accurate. In Mexico a collectivo is a shared taxi which is indeed a kind of collective but not exactly the way we would think about it on Canada. Another example – don’t tell anyone you are “embarasada” unless you really are pregnant or you might well be red-faced. I agree whole heartedly about the skinny jeans. I am 25 and have a fairly lean build, but I have curves. When I put on skinny jeans, it really emphasizes the width of my hips. REALLY not a flattering look. I’m just waiting for the skinny jean fad to go away, or at least expand to other options. They make me look like turkey drumsticks shoved inside sausage casings. GAP 1969 jeans. Fabulous! Stretchy. Forgiving. Comfortable. Tons of sizes. Believe me, I am way older than you are and have pretty much the same shape. Talbot’s signature jeans are also excellent and they have many styles for all shapes. Daughters are the best. Mine takes me to Nordstrom’s sale and finds me exactly what I need and feel comfortable in and for a good price. I love it that she is now an adult (with taste…….who knows where she got that from!) Have a great time with Sam! My condolences about your laptop. No matter how many computer experts are around, it still presents a period of time with inconvenience. Yippee! Your blog is fixed! Your laptop is broken, but for us out here in reader-land, it seems a good trade! I think the idea of a phot of a two year old modeling a sweater one arm in one out is perfect–that’s what it’s going to look like in real life, anyhow, right?! You deserve a gold medal in the Computer Olympics that we all participate in every day. Why, because YOU BACKED UP your files. As a former computer support person, I know most people don’t back up. Three cheers for the harlot !!! Rah, Rah, Rah.!!! Lou’s sweater is great. Hope the clothing search went well. Yes, NO skinny jeans! And skinny people look bad in them, like gangly alien legs. You know, back in the 80’s white lycra spandex pants were risky (please don’t bend over in front of me… aaaggghh!). Aren’t skinny jeans just new packaging with a denim look? Since you’ll be doing a lot of moving about, I agree with the comments about yoga pants, sounds good as long as you stay away from those that are see-thru when stretched. I can’t figure out why most of them are styled as low riders though, wouldn’t you have to be yanking them up all the time? The better quality ones have some tailoring, heavier fabric and more style, sortof like the 70’s leisure suits but for flexible persons. Have fun shopping! See ya on the 6th in San Fran. I have to totally disagree… I am over 40 and have skinny jeans and know I look good in them IMHO… You need to find the correct pair for your body. The Loft makes great jeans. 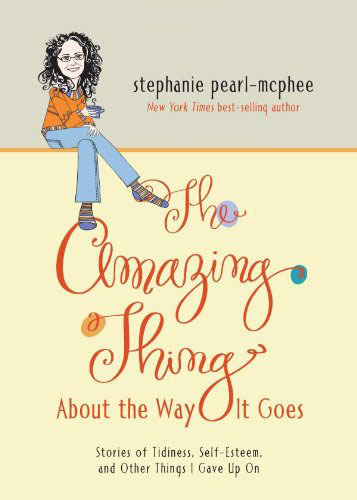 Pleases send Stephanie to Nova Scotia to promote her upcoming book. We love her out here. I kind of like the iPad version. The usual type you use is a soft grey , that I sometimes have difficulty seeing, so this is better! And , that two year old , “I don’t want to cooperate with your picture taking thing” is a real thing! I said that until I tried Levi’s Curvy Skinny jeans! Yeah, never say never on the skinny jeans. I was on one of my “I’ll try anything in my size with a red sticker” moods, and ended up with a pair that I really love. A big sweater and flats, and I’m good to go. I, too, am a clothes shopping phobic. Until Monday of this week. My 88 year old mother has always been a clothes shopping phobic. Sunday she fell and broke her hip (she’s doing great alreay!) so I had to go to her closet and get clothes together for the rehab stint. She has been wearing basically a couple of pants, a couple of tops, two scraggly bras, one of which doesn’t really fit anymore and underwear that is showing the elastic. At that moment, I decided I needed to have a decent wardrobe of basics… and underwear without the elastic showing… so I would not end up being like that when I am older! PS – I also bought Mom some new clothes and underwear! I only wear skinny jeans when I want a certain someone looking at me. Straight-legged ones are much more flattering on me and I think I’m a similar size and shape. Also, my baby sister says darker still is trendier. That is all I know about jeans except that I hate the ones that show my undies! If you are never going to put on skinny jeans, may I suggest you not go shopping with Debbi either. Ask me how I know. I work at Michaels, and on the first day of this Polar Vortex awfulness I had a shift and found myself baffled that we had any customers. I will never allow anyone to mock my stash again. Trying to decide if I can blow off my 31st wedding anniversary, to see you in Seattle. I mean, hey, I’ve already had THIRTY anniversaries with the guy already!